Where's Polly? Here I am! Whew! That was quite the absense from blogland and I am so sorry. 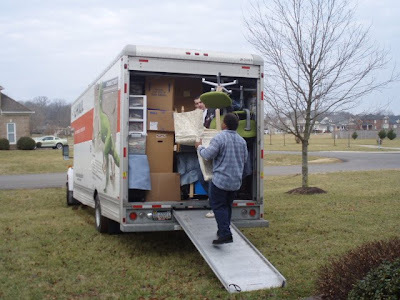 Many of you know that I have been moving across the country - literally - and I have been very busy, not to mention just plain exhausted. Thank you to all of you who sent me emails checking in on me. I so appreciate the friends I've made here on this little blog. As most moves go, ours was certainly eventful. When it takes you 3 1/2 days to get 1300 miles, you know you've got issues. So let me tell you about it. On the leaving end, we were running behind from the get-go. We had a lot more things than I remember packing the last time around. Never fear, that's why we have great friends in our lives. I just happen to have a close friend who is a house mom at a fraternity who has guys at the ready at the drop of a hat. One call of panic and she shows up with 4 guys. We packed and packed and packed, and loaded and loaded and loaded. The first group of guys (yes, I said first) took great pride in the fact that they packed the truck like a jig saw puzzle, and they did. We'll get back to that in a little bit, but just wanted to show that first truck. 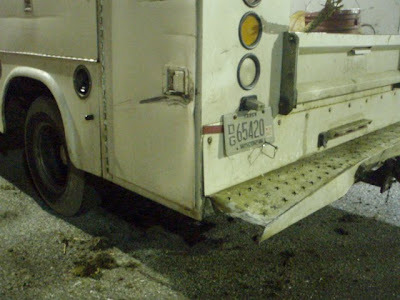 The second truck was not packed quite so tight or pretty, and there was one casualty. My angel's head fell off. That's a post for antoher day. So after packing and loading all night, we realized we weren't going to get finished AND we weren't going to have enough room. 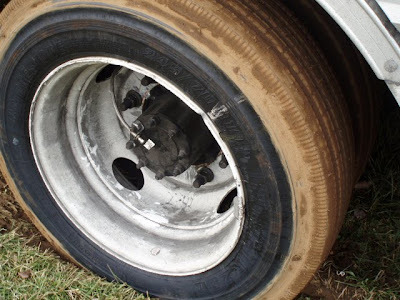 We talked with the guys and determined that we were going to need another truck, and another day. Soooo the next day I thought we were going to have 2 of the guys back, but my friend being smarter than me and thinking with a clearer head knew we were going to need more than that, so she planned for 7 guys the second day. And she was right too because it took us another 12 hours just to finish packing. God bless her because I sure don't know what I would've done without her, or those guys. So with all of them, my husband, my friend and me, we had a total of 10 people working on getting us packed and out of there. Now let me cut to the chase and tell you a few quick things since I can already tell this is going to be along post. 1. Teenage guys CAN be responsible. 2. When they are tired and under the gun for time, they begin to throw stuff in boxes that do not necessarily go together, evidenced by locating a sewing machine in the box of kitchen towels upon my arrival. And finding shoes in boxes of office supplies. And shampoo with dishes. And toiletries in boxes of spray paint. I still haven't found any of my brackets to hang my drapes, but one thing's for sure, I know I'll have to open each box to look. 3. They do care about people. Those boys worked so hard for so many hours. Now let me tell you, every time we've ever had to use their help over the years, we've always payed them each $10 an hour. That adds up really fast. Well, these guys - I kid you not - came to us during the moving process and said they wanted to do this for us for free because they know what we're going thru financially right now. They only asked that we sign off on their required philanthropy hours so that this would count towards their goal. Anyhoo, well in to the packing, we decided to go ahead and get that other truck. Huge bummer this was since we thought we'd be driving only one and pulling a car. Now this meant I had to drive one too and follow hubby all the way to KY. The expense of another truck and double the gas - UGH. That hurt. Off hubby went to get a 14 foot truck. The guys got it almost loaded and then all of a sudden, the guy in charge of packing the truck told me there was no way we were going to fit everything in this truck either. WHAT DID YOU SAY? That's right, not. gonna. fit! Even taking tons of stuff to Goodwill and tons of stuff to the dump, still, not. enough. room. This my friends, is where I started to have a breakdown. I was so afraid to even tell hubby. I knew this wouldn't go over well. It had already been a very stressful day. I'll spare the details of the drama involved in the decision to get a bigger truck. Those poor guys had to unload the truck they had just loaded! And they weren't even upset about it. Back went the 14 foot truck and in came the other 26 foot truck. The guys reloaded that one with all of the stuff they had set out on the yard from the one they had just unpacked. We decided that we may not have enough stuff to completely fill that big of a truck, so I told them they may want to pack this one a bit looser. Oh, huge mistake. Never tell teenage boys to "just get it all in there however you can". They will take you very literally. And by the way, we had plenty left to fill that truck to the brim too. On the other end, this truck was a complete mess. too twice the time to get it unpacked as the first one. After all was said and done, with no sleep for almost 2 full days, we decided to hit the road. Let me correct myself there - hubby decided for us to hit the road. I told him I didn't think I could do it and suggested that we just go get some sleep in a hotel, but noooo, he thought we should get on the road and put a few hours behind us before the next day. So we drove about 6 hours and stopped for the night. First night, all is well. We finally got some sleep. Next day, bright eyed and bushy tailed, we hit the road thinking we'd drive about 10 hours or so. About an hour into the drive we both realized how tired our bodies were, so we drove in a daze, fighting sleep the whole day. 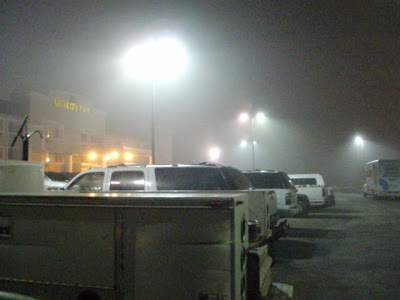 About midway through Kansas we started to hit heavy fog. Heavy. The 'I can't see a thing' kind of fog. After driving just about 6 hours, we had to stop for the night again. We were still exhausted and just wanted to get to bed. But no, that just wasn't going to be part of the luck we were to have that night. That's a gash in that tire about 4 inches long. 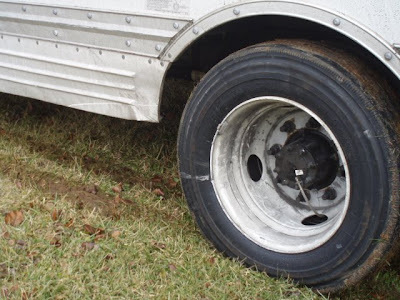 You know what a 4 inch gash does to a tire? It lets the air out. Let's the air out of a tire on a truck with 12,000 pounds of boxes on it. Hmmm, how do ya jack that up to change it? Oh yeah, and this. 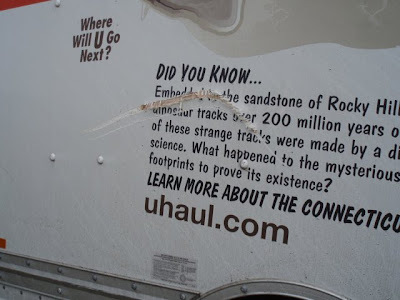 Did you know that the side of a Uhaul truck is pressboard? Me either until I saw this. 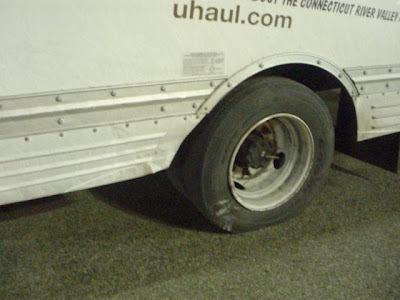 Now how did I get that gash in tire and the slash on the side of truck you ask? Apparently I had a little dance with the end of this truck. 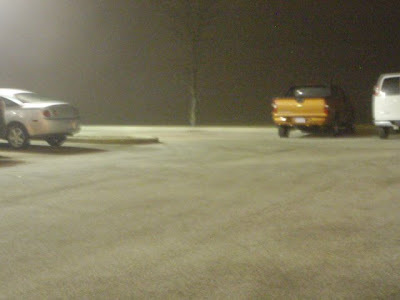 Now in my defense, it was very foggy outside. And he was parked on the end of the row, with his extended bed truck parked directly across from another extended bed truck (from the same company I might add). 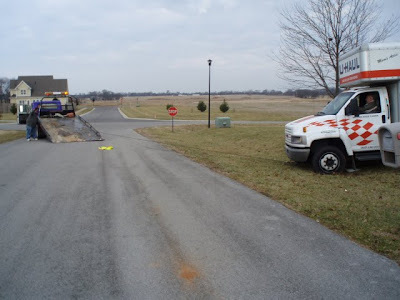 Now how do you expect a large truck to make that curve? And that extended length van on the end with them didn't help either. See how his truck sticks out 3 feet further than all of the others? NOT my fault I tell ya. 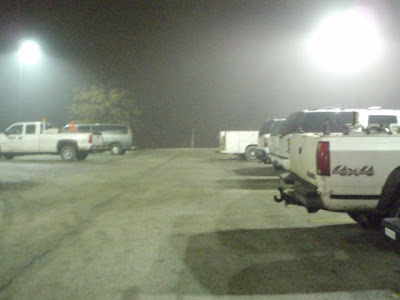 And then there were these illegally parked vehicles at the end of the lot at the start of my turn. Don't be fooled, they are a lot closer than they appear. 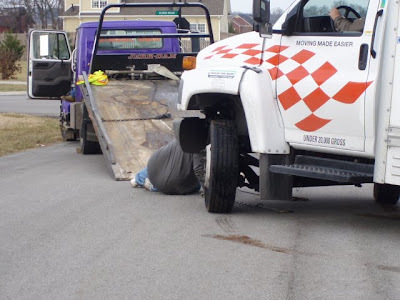 Look at the edge of the curb and the edge of the truck. And last but not least, there was NO sign at the entrance to the hotel drive saying that large vehicles would not fit in the parking lot. Once you make that turn into the lot, you're stuck. There's no where to go and nowhere to turn around, and it doesn't look like it's going to be small. One of the workers at the hotel told me this happens all the time. I asked him why they didn't have a sign and he said they used to but someone knocked it down and it was never put back up. He said an RV had done the same thing that morning! Well then fix the (@^*^$@$&@^ thing already! 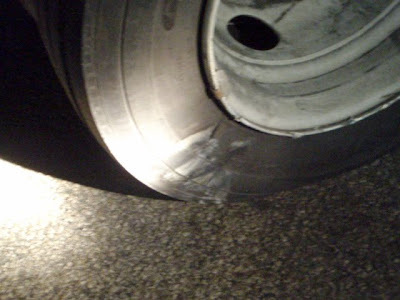 To say the least, it was a long night of waiting on roadside assistance to come and change the tire, waiting on the police to finish their reports, etc. Not too much sleep again that night. Skip ahead to when we finally arrived at the new house. The moving company shorted us a person. That was an hourly argument that I won't get in to. Just know that the second day I let them go in the middle of unloading the truck. Yes I did. I warned him not to show up again with less than we had booked. I was able to get some guys to come right over and finish unloading us though. 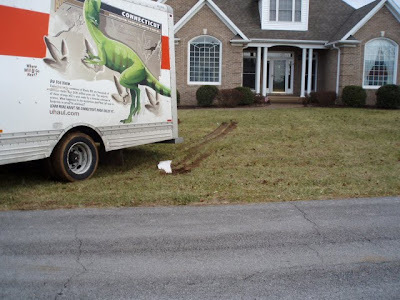 For convenience, they pulled the truck up to the door as you saw in the first picture. Here it is again. Well, it had been raining all day the previous day. Notice how those front tires are in the ditch. 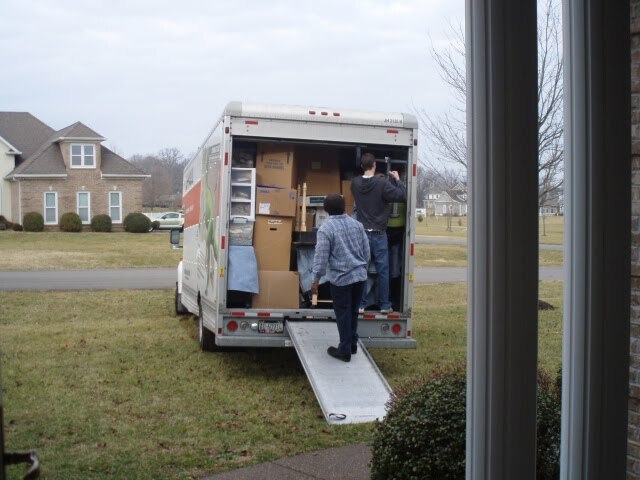 After they were finished unloading, we had to get the first truck back to Uhaul and get started on the second truck. We got ready and jumped in the truck to head back over to turn it in. One problem. Uhh, the ground was wet. 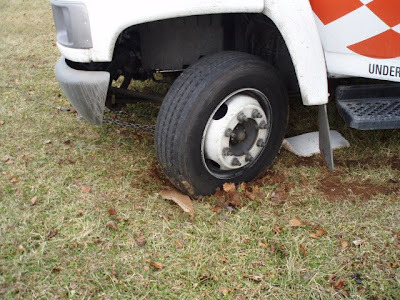 Doesn't look so bad here, but remember I told you those front tires were in the ditch. Spin, spin, spin. Digging deeper ruts the whole time. See what I mean? Can I tell you how frustrated hubby was at this point. Trust me, you do not want to know. We finally had to call in this guy. Yet another expense we weren't planning on during this trip. Things just never seem to look as bad in pictures as they actually are. 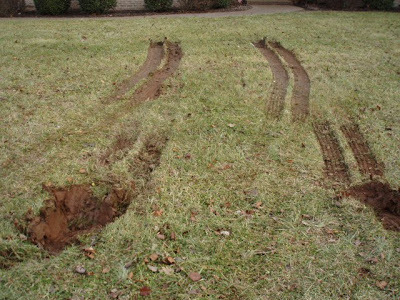 Trust me, these ruts are bad. He pulled the truck right out like it was nothing. So the end result is this, and now I have to figure out how to fix it this week. If only it will stop raining long enough for me to get out in the yard. 14" deep at the worst point. Are you a yard expert? If you are, please tell me how to repair this. Seriously. I know this post has gotten too long, so I'll end here for the day. Give me a few days and I'll come back and let you into my little world of lots of boxes. I've gotten more accomplished in this room than any other so far, if that tells you anything! Whew, I need another nap. Actually I need to go bed. It's 1 am here already. Wow. May all that be forgotten soon as you start to enjoy your new home. It looks beautiful! For the sod, don't you just have to fill it back in with soil? And tramp on it? Then reseed it? That's what I'd try anyway. Oh dear! Adventures in moving!!??!! How awful! But I am glad you made it there in one piece. I hope your unpacking goes smoother from here on out. Wow - what a harrowing tale! You poor things - so glad you made it to KY in one piece - that is where my husband and I are too (Prospect). We retired from So. California 18 months ago - that is a long drive isn't it? Especially through Kansas with fog. 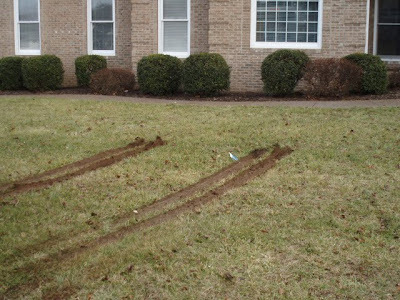 About those ruts - you are probably not going to be able to do much with those till Spring and until the ground dries out a bit. I'd go to a good nursery and talk to them - many nurseries are closed for winter right now so hold tight for another 6-8 weeks. Welcome to Kentucky - hope you love it here as much as we do! What an ordeal! I'm sorry all this happened during your move. I'm sure it made for a LONG week. 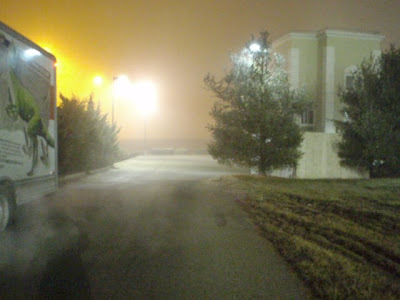 Of course I can relate to the fog in Kansas...it was terribly foggy here for like 5 straight days. Even though the trip wasn't smooth sailing, I am glad you made it safely and with all of your belongings. Sounds like a wonderful group of young men that helped you pack and that's nice to hear too. Good luck with the unpacking. Looking forward to reading more about your new life in Kentucky. Oh my! This could be called Polly's Moving Nightmare! I would have been curled up in a ball and crying my heart out! We packed and moved a couple of months ago, and we're "camping out' in a rental home while we are building. So it will be an experience to unpack everything later on this year. I have forgotten about most of the things we own, LOL! Good grief, Polly! I was right along with you ~ I know how I get when I'm tired ~ emotions can run high, plus I will cry at the drop of a hat when I'm really tired. I'm not an expert, but I do work in our yard. 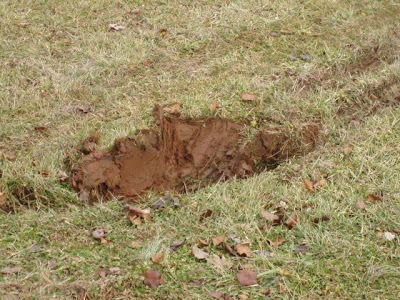 I'd wait until that dries up and then you need to level it out with dirt and put some grass seed on it. Shovel and rake will be needed. You're there now, and it's just a matter of setting up how you want everything. I'd do one or two rooms to the way you want and then take your time on the rest. 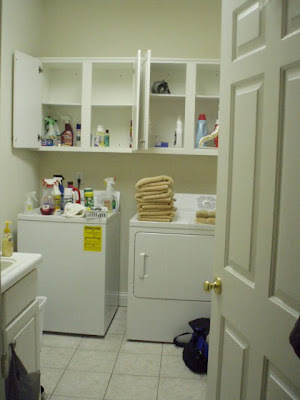 This way, you'll have at least two rooms you can go in and not feel stressed. Oh my goodness! Sorry about the rough journey! Your new home looks lovely, but what an ordeal getting there. I’ve moved several times myself and understand even under the best circumstances it can be stressful. I hope you settle in quickly and like your new place. Oh my!! I am breathing hard just reading all your mishaps...Moving is never fun, but you really went through the worst. Hope you are enjoying your new home enough to make up for it. It's a beautiful home from the outside. Looking forward to seeing the wonderful things you will do on the inside to make it home. I am sad you went through all this. It will be wonderful when you get settled in, trust me!